So you’re looking for a junior starter drum kit? But you’ve never cared much about hoops, loops, kick drum, floor tom, drum heads, hi hats, drum shells, or shell sizes? In that case, I’d love to help you out with this best drum set for kids reviews. The Questlove Pocket Kit is our top pick because it provides a full-scale, high-quality playing experience for young drummers at an affordable price. Information about suitable age reange, important aspects, and my personal best starter drum set for kids as well as other complete junior drum sets – it’s all in here. And I know these recommendations “work”, because I’ve tested them with dozens of my students and their parents. These are top sellers that all have excellent customer ratings. Plus, these junior starter drum all come with their own kick pedal, drum thrones and drum sticks, and will be ready to use out of the box. So your child can start playing drums right away! 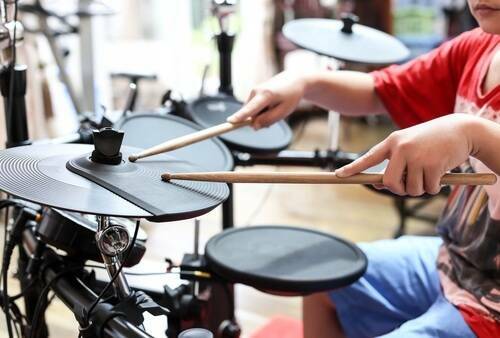 One word of caution though: if you’re already dreading the noise your child is going to cause with a drum kit, check out my electronic drum set recommendations. They are much quieter than acoustic drum sets – and not necessarily more expensive. If, on the other hand, you only want to see the cheapest drum kit options for kids, go here. Who Are Junior Drum Sets For? Available in several colors, including wine red. Yet, the cymbals and hi hats do sound pretty bad. That can’t be denied, but it’s the case with any junior drum set. And from my experience: none of my students care, so your child probably won’t either. They want to have fun and learn rather than sound good. And this kit definitely sounds better than a toy trying to be a musical instrument. hardware – it has adjustable hardware that is more sturdy and durable. cymbals – they are low-quality like with any other beginner drum set, but they sound slightly better than the Mendini or Gammon cymbals. And you can always buy good and affordable new ones later. the price – compared to the Mendini and Gammon kids drum sets, I think it’s not unfair to call the Ludwig kit overpriced. 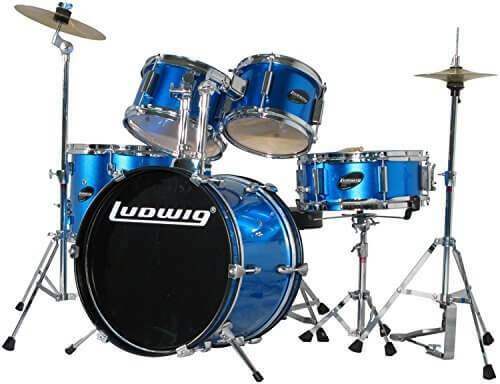 For all the pros and cons of this kit, read my in-depth review of the Ludwig junior drum set. My verdict: decent quality junior drum kit, but nothing there that justifies the 130$+ difference to the Gammon and Mendini sets. Gammon junior, like Mendini, is a brand virtually unknown to most drummers. But that’s why their starter drum kit come at such good prices – but not at the expense of quality. This 5piece junior drum set has decent drum sound with fairly bad cymbals, I’d say. That’s normal for the price and, again, from my experience children don’t care as much about sound, they just want to be playing drums. They do care however whether the set comes apart after some time or not, and the Gammon hardware is slightly lower quality than the Ludwig’s. 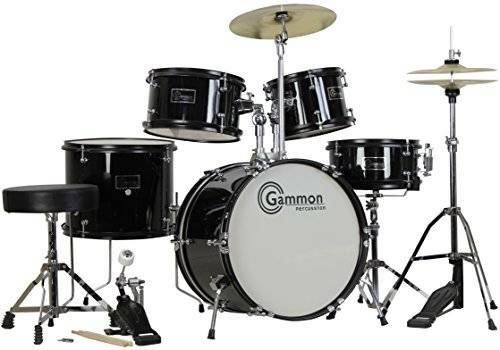 For details and current deals, check out my full-length Gammon drum set review. What’s nice for girls with the Gammon kids drum set: there’s a pink color option that’s a hit with my young female students. My verdict: Strongly recommended as a complete real deal musical instrument for little drummers. The Mendini by Cecilio junior drum set is the cheapest drum set for kids that’s actually useful (for the setup reason above). Why? As you might hear, the sound potential is very similar to that of the Gammon Junior 5 piece complete set. And the same goes for price and hardware durability. The only thing that sets the two drum sets apart is that the Mendini kit comes in 6 color options. That’s not a huge difference, but from my experience, color can influence a child’s motivation to practice. My verdict: The Mendini 5piece junior kit is my best drum set for those on a budget. Before you buy, check out my Mendini by Cecilio junior drum set review. The Questlove Pocket kit by Ludwig is targeted towards the beginning drummer who needs a complete drumkit that is durable, sounds good and can be used right away. The suggested user for this kit is 4-10 years of age but the Questlove Pocket Kit could actually be played as a cocktail kit (i.e. a portable drum set) by a gigging drummer in a pinch. That says a lot about what can be accomplished with this little drum kit. With the Ludwig Questlove Pocket kit, drummer legend Ahmir Khalib “Questlove” Thompson aimed to create a drum set that would provide a full-scale playing experience for young drummers and the Questlove hits a bullseye with a quality-to-price ratio that fits just about any budget. The GP Percussion GP55BK is an entry level starter drum kit that is geared towards beginning drummers from the ages of 4-8 years. This is a drum kit from a company who’s badge also appears on percussion products such as bongos, timbales, snare drums, shakers, drum stands and pedals. GP Percussion GP55BK drums are fashioned from real wood with tunable drum heads and can be made to sound surprisingly good. It comes as a complete set of drums with hardware, cymbals, stands as well as a drum throne so that you have everything you need to immediately begin working on your drumming chops. 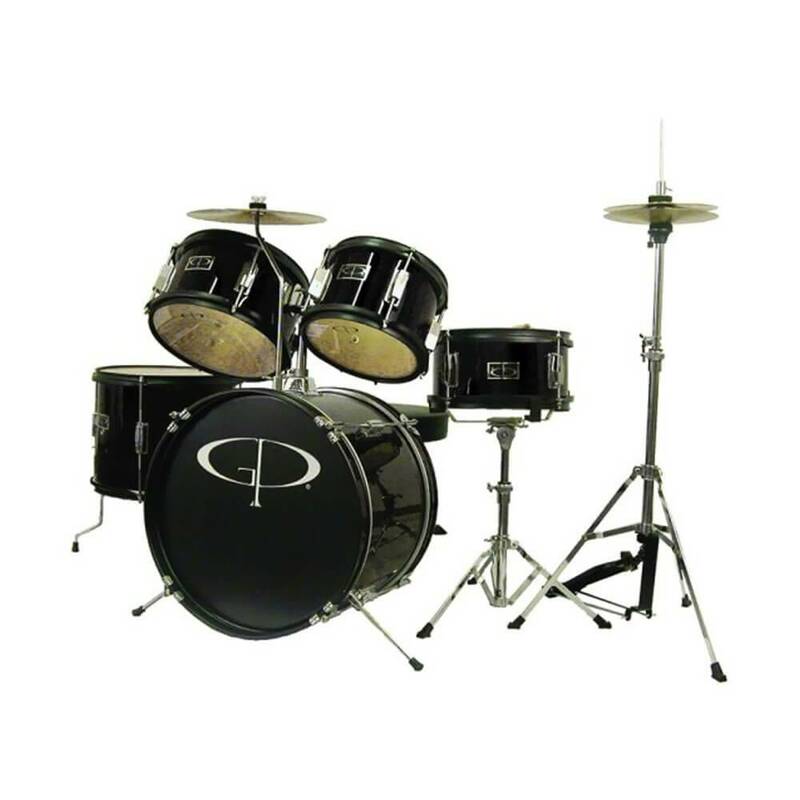 This kit is made for a youngster aged 4-8, who is expressing an interest in playing the drums or already demonstrating a talent for playing. And the GP kit is a durable enough to take a beating while a young drummer grows in age and accomplishment. In my estimation, the GP Percussion GP55BK rates at about the same level as the Mendini Junior and the Gammon Junior drum kits in terms of overall quality. The price of the GP Percussion junior kit (currently!) is slightly higher, though. I’ve craved writing this section for a long time – for there are so many junior drum kits out there being sold as a musical instrument that in truth are only toys not really playable. No, this is not about age! After all, a 6 year old child could be any size, and size is the thing that actually matters. It’s about whether your child can comfortably reach the bass drum pedal and the cymbal (highest and lowest points of the drum set) while sitting on the drum throne. These junior drum sets will work best if he / she is between 2.5 ft and 5 ft. Shorter will result in stretching (but he/she will at least be growing into the set). Taller is a no-go, because it will result in unhealthy squatting and will obviously get worse in time. The 3piece junior set in the first photo is basically drums with small cymbal attached. It is missing many parts compared to a complete full size kit. Actually, it is more like a toy drum and not a real musical instrument, as it doesn’t even have a decent cymbals stand. With that cheap toy drum, your child will not be able to internalize many motions essential to drumming. In effect, your child would miss out on the opportunity to playfully pick up the right motions from the very beginning. 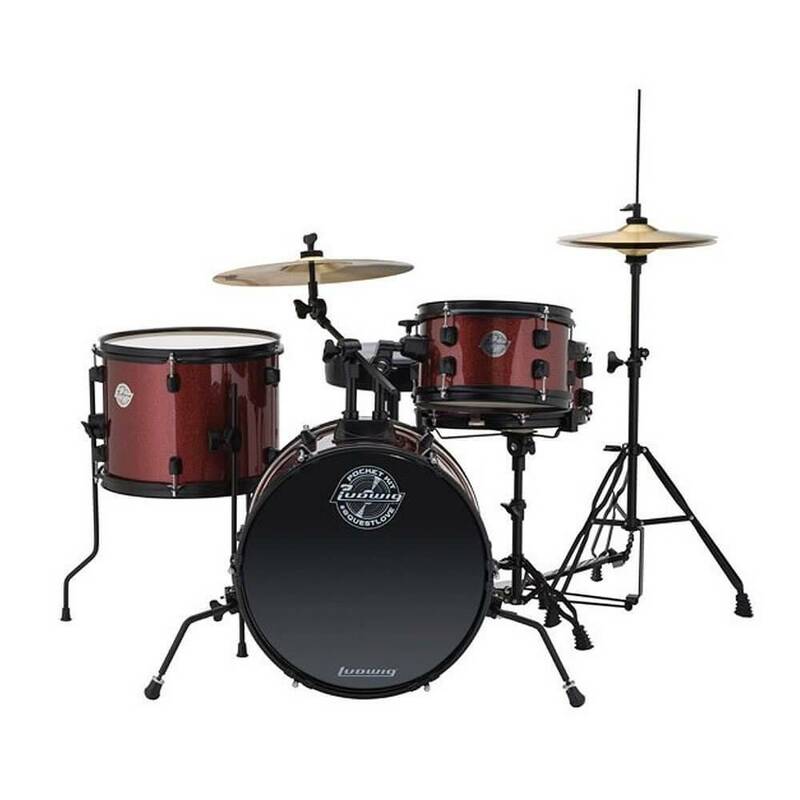 And all these drum sets I’ve reviewed here do provide this opportunity, because they are set up like the above standard complete full size adult drum set. If you are serious in finding a worthy childrens drum set, then consider one of the choice products featured in this review. …I said this won’t be important to the absolute beginner and I stand by it. Still, changing heads or cymbals might become important once your child gets really good and still hasn’t outgrown his/her junior drum set. When that’s the case, you’ll know where to look. Again, if your child is taller than 5ft or will soon be taller than that, I recommend you look for a complete full size drum set for beginners instead. If by contrast, you’re looking for a Professional drum set that you can take with your on the road and / or that is much quieter than an acoustic drum set – check out my electronic drum pad review. Finally, I’d love to hear about your personal experience with junior drum kits and related products– if you’re looking for replacement parts for snare drums, floor toms, foot pedals, or if you have any issues and questions concerning these… Let me know in the comments. I’ll respond 100% of the time. If this best drum set for kids review was helpful and if you decide to buy one of those drum sets for your child, please consider going through one of the links or buttons on this page. This won’t cost you a cent more but I’d receive a commission and you’d have rewarded me for putting a lot of care and effort into these reviews. Please note that I have no incentive to make any particular product better than I really experienced it to be, because I’d receive a commission on any of the products on this website. You can read more about my reviewing ethics in my affiliate disclosure. I’d make the transition once he’s grown taller than 5ft. I think that’s an awesome idea! I’d strongly recommend the Mendini or the Gammon that you can read about in this article. Also check out the links to the full reviews if you want. In short, both are in my opinion perfect beginner sets for kids, because they are very affordable and will last for the first 2-5 years of drumming, depending on your child’s learning curve and musical ear (at some point he’ll want to get new cymbals, I’m sure). you have the pearl, but no review on that drum…what are your thoughts on that one? is it the same as the others but over priced? Thanks for your question, but I fear I don’t yet fully understand. I do have reviews of the Pearl Export and Pearl Roadshow on this site, but neither of those are drum sets for kids (they are too large), so they are reviewed in the best beginner drum set (for adults) review. I know it’s recommended I transition my child from a jr set to an adult set once he hits 5′ however my son is currently 3″ away from 5′. If it were you would you take the leap and get an adult sized set now or purchase the jr set and plan on purchasing the larger one as soon as he hits his next growth spurt :)? I’d really like to give him something that he won’t outgrow in a year if I can help it. I guess it won’t take long until he hits 5′, right? If you’re looking at less than 1 years for that to happen, I’d certainly get an adult set – otherwise the money for the junior set wouldn’t be worth it (for me), and you’d probably confuse your son as he has to adopt to 2 differently sized drum kits in such a short span of time. And by the way: you can get an overview of my favorite adult drum sets here. Thanks for asking! When it comes to drum sets, it’s only about your son’s size not his age. Up until 5′ I strongly recommend to go for a junior drum set. And you have my favorite options right here in this article! I’m looking into drum sets for my 3 year old son. I saw your recommendation above regarding the Mendini or Gammon, however we are living in an apartment and sound travels. Do you have any electronic drum recommendations for this age group? We are hoping to move into our house by next spring…would you recommend that we wait until that time to purchase one of the Mendini or Gammon sets? Just really unsure of what is best for our beginner drummer. Thanks for your question. You could buy him either an Alesis Nitro (best price / performance ratio for a practice kit) or a Yamaha DTX400K (click link and scroll down) (best for silent practicing because it has an especially quiet kick pedal). Yet, since you have both options I think your son should decide, as he is the one who should be into those kits enough to actually play them for a longer time (I suppose that’s your goal too). So perhaps go to a shop with him and let him try out an electronic kit and an acoustic and see what he responds to more (could be any model – this is just to find out what type of kit he prefers). UK or Athens, Greece. Any ideas as to where I can find it please? Thanks for putting up this comment after our initial email. Turns out, I was mistaken and the Mendini is currently not available in the UK. However: the Gammon is and it’s very, very similar to the Mendini. What if I’m looking for something for a 5 year old girl who does not have access to lessons at this point but seems interested? She picked up some sticks in a music shop and started messing around and was really immersed. She then went to a workshop on taiko where they used large plastic things as the practice drums and she loved it. I don’t know that she will get serious or not and whether there will be an opportunity for her to take lessons but I thought it would be a fun gift for Christmas and see how she likes it. I don’t want to buy a good and pricey practice set ft she ends up not ever taking it up as an instrument. Basically at this point, her parents are just letting her explore things like dance, art, etc. I saw that she liked drumming and thought it might be nice to let her play around some more to see it she wants to stick with it. She hasn’t stuck with anything yet so maybe something very basic to start with? Cool thing she’s interested in drumming! I can personally vouch for this kit as a first one for a child (there are 2 reviewed in the article, but I’m talking about the Junior kit). If you don’t want to go for a kit quite yet, you could try out a practice pad or even nothing at all. Both won’t really spark a kid’s motivation in my opinion though. In that regard, this cool gadget might be better – but then again you’re cheaper off with a junior kit. So I’d say go to a music store with her a couple of times and let her try out the kit, perhaps get a practice pad alongside that. If she’s still enthusiastic after a while, I’d go for the kit. And probably most importantly: have her check out this Youtube channel by a junior drummer for junior drummers. Hi, thanks for your reviews. I bought a Junior set for my 5 year old. Do you recomend setting up the whole kit or maybe just kick, snare, hi-hat at first? I do recommend to set up the whole kit right away. Your child will have to learn it all anew anyway, so why just give him / her just a piece of the pie? I think the risk that he / she will have to un-learn certain movements outweighs the reduction in complexity here. Also, remember that children mostly aren’t as intimidate by challenges as we adults are. I’m quite sure your child will be happy to have a whole drum kit to explore. Do you have any recommendations for books on drumming level 1 for a 10 year old? Trying to chose one for a Salavation Army Christmas Angel gift so I don’t have a lot of information about the child. 10 year old girl. Awesome that your gifting drum lessons to a kid. I really appreciate that! However, I don’t think a drum book would the be best choice for a child, since books aren’t the medium kids at that age like to learn off of. Just my two cents, and there certainly are books, but I’d rather get her a drum lesson in a local drum school (if it’s for trial purposes they should give you a discount or even do it for free), or point her towards these lessons on YouTube if that’s accessible to her. Thanks for these reviews. Its super helpful as I don’t see much out there related to kids kits. We don’t have a ton of space and I know you recommend the full kit, but if we were to go with a smaller kit, would that adjust your recs? No, I wouldn’t change my recommendation, since these junior kits have fairly small shells already and you can’t really go smaller than that. Unless: you left out some parts and bought, say, only a snare, a hihat and a bass drum to start off. But then, buying these things individually would probably cost you more than buying the full kits shown here. So the answer is still no, but if you’re really short for space, you can just buy the kit and only set up the three parts I mentioned at first. Thanks for writing this – it was super helpful. Where I live, the brands that have a drum set that looks like the ones you recommend are RB, GP and CB. The RB is about the same cost as Mendini / Gammon and the GP and CB are quite a bit more ($100-300 more). The RB can be tuned, but how can you tell if it can be tuned well or not? And how do you tell if the hardware is durable or not? Do most drum kits come out of similar factory/manufacturers (in other words, is there a pretty good chance that if I buy this kit down the street, it’s quality will be comparable to one of the brands you recommend so I don’t need to get it shipped here for a small fortune)? Thanks for your kind words and your question! Well, if a drum set can be tuned, that’s all there is to it – for if it can be tuned well or not depends on your tuning abilities and (sometimes) the heads, not the drum kit itself. Other than that, I’d need to see the kits to say more about them. Would you mind posting the links here? And just out of curiosity: which country are we talking about (the one where you live)? Thanks for the quick response! Hopefully the heads are good as I sure don’t have confidence in my tuning ability! I see. In that case, I’d recommend for you to go with the Granite Percussion. The RB looks very toyish and has the cymbal in the wrong place; the CB looks better but has the cymbal “issue” too. I have 2 boys, 10 and 12. Both play piano, one also plays the trumpet… so they are both musical and can read music. I am wondering if you think the Mendini junior set or the Ludwig Pocket Kit would be better. The 12 year old loves to listen to and play Green Day, Def Leppard, Metallica, Guns N Roses, Led Zeppelin, etc. I don’t know if that would influence your answer or not. 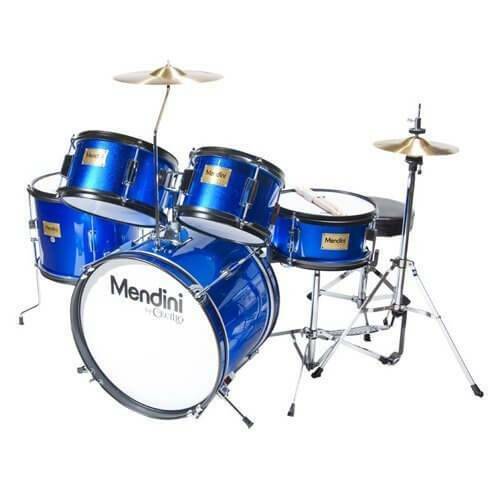 …if you sons are below 5ft, I’d recommend you go for a junior drum set and in that case I’d lean towards the Mendini Junior. The Pocket Kit is a good one too, but I’ve made so many good experiences with recommending the Mendini to my students that I’d say you can’t go wrong with it. If your sons are about / taller than 5ft, I’d recommend an adult drum set so they will be able to play it for years and years. In this case, my best advice would be the Pearl Roadshow (you can also see it compared to other kits here). Hi, this is so useful! Thank you for taking the time to write and share it. I am looking for a kit for my (just about to turn 8 and way under 5ft tall) son. He hasn’t drummed before so I’m loath to spend a fortune until I know he likes it. We looked and in the UK can’t find the Mendini kit and wondered if the MIRAGE JDK JUNIOR 5 PIECE DRUM KIT might be a suitable replacement ? I’m not certain but I think the 3 piece version is the one you show in the image above as an example of what NOT to buy! You’re right, the Mendini isn’t available on Amazon UK. And you’re also right NOT to go for the 3-piece option. To be honest, the Mirage looks a bit toyish, so if I were you I’d at least consider the Tiger kit although it costs quite a bit more. If you’re okay with a more toy-like kit that you probably would have to swap once you’re son is becoming more experienced (1-2 years), the Mirage seems fine in terms of quality. Of course, I haven’t tried any of the 2 kits, so I can only speak from what I gather from other reviews. Thank you for your reviews of various drum kits. My son will be turning 11 in March. He is approximately 53″ tall. This is his 2nd school year playing the drums. In January he will have an opportunity to try out for 5th grade Jazz band. We found a local place offering a good condition Stagg 5 piece drum set for $275. Space is a HUGE consideration for us, and I’m not crazy about the noise but we were told not to get the electronic “silent” drum sets. I appreciate your advice and specific recommendations in that price point or lower. I also imagine that lessons will be very helpful for him as well? Thank you. Wow, the Jazz band already. That’s awesome! Would you mind posting a link of the Stagg here, so I know exactly which one you’re talking about. Hi Yannick! Your reviews were very helpful! My husband and I are getting our 7 year old son a drum set for Christmas this year and found the one we are going to purchase through your article. We are going with the Mendini kit. My question is, does this kit have the same cymbals and the same amount of cymbals as the other kits? And if it does not have the same amount or the same ones then which ones is the Mendini kit missing and are they necessary to have/should I purchase them separately? Thank you for you time and such a great article and review! It was extremely helpful and we will be buying through the link on your page. As for your question: yes, the Mendini junior comes with the same amount of cymbals that any junior drum kit would have (a hihat and a crash cymbal). Hope that helps! Otherwise, I’m here for you! My son has just turned 7 but he is already 4.3 ft tall already. I want to purchase a drum kit this week for him. Do you think I should go for a junior kit or go straight for an adult size? The answer is: it depends on how fast he’s growing and how long you want to stick to this kit. For once he reaches 5ft he’ll need an adult drum set fairly soon or he’ll have to adopt unnatural playing positions which might even be bad in terms of posture, back etc. However, junior drum kits are quite a bit cheaper than adult ones and they are a great way to test if a person sticks to drumming after all. So unless your son will surpass the 5ft mark within the next 12 months, I’d go with the junior kit first just to test the waters. That’s great. Thank you so much. Feel like I’ve read too much to make a decision 🙂 I was thinking of the Ludwig Pocket Kit By Questlove as the review doesn’t show so many cons of 5ft stooping and I’m in the UK so some of the others aren’t easily available. Do you think that would be a good buy? I haven’t played the Stagestar yet, so I can’t say anything based on personal experience. Yet, it’s not a junior drum kit, so I think it would be too large for a 2-year old. How tall is he / she? As you might have read inside the post, I recommend for kids to play a junior drum kit up until they’ve reached 5ft. Have you considered the kits in this article? He’s very tall for his age. We’ve looked at Ludwig and DDrum (same drums, same manufacturing plant, different paint) and they are okay. We are just huge fans of Tama. Sound/quality is amazing. Okay, I see. I mean it’s up to you and if you love the Stagestar so much – by all means get it. Otherwise, I can fully recommend the Ludwig junior. Many of my students play it, and I think it’s a good starter kit all around. I stumbled upon a Pearl Roadshow Junior kit. Are you familiar with it and can tell any differences, pro/cons vs the ordinary Roadshow? I also found a Mapex Tornado Junior in a kit with Zildjian Planet Zlatan cymbaler including a ride. What do you think about that? Also thanks for really good articles! I’m happy your son is excited to drum. That’s great! The Pearl Roadshow Junior models I could find are exactly the same as the Pearl Roadshow adult kit in terms of hardware and built. The only difference is the shell size – most importantly the smaller bass drum (18”). The only thing that concerns me a little is that 18” can be a little large for a child. Usually I recommend sticking with junior drum kits like the ones in this article (that is, 16” bass drums) until a child grows taller than 5ft. So while I can fully recommend the Pearl Roadshow junior, I’d consider that your son might have to stretch and strain to reach the toms on that kit. Where did you find the Pearl Roadshow Junior kit? I couldn’t find it online in the States. I’d appreciate you dropping a link here! My daughter is eager to play drums but an acoustic set, while preferred, is not going to help me get her started due conflicting opinions on noise. The alternative is getting her an electric set. I worry because i think acoustic will create better “habits”, but the alternative is doing nothing until we can find a good solution for the noise. I fully expect to put her in lessons which i assume will give her the opportunity to use an acoustic set. What are your thoughts? Thanks for your question – and great that you’re daugther wants to be a drummer! I do understand your concern and there certainly are drum sets around that would create bad habits (for example they aren’t set up the correct way, as explained in this post) – but if you go with one of those kits here your daughter will be fine. There will actually be very little difference between those electronic kits and an acoustic kit. Swaping will feel a little different, but there isn’t anything significant in terms of muscle memory that would require un- or relearning. And taking lessons will be possible on both an acoustic and an electronic kit. Is you daughter taller than 5” yet? If so, I’d particularly recommend this electronic kit. Many thanks for the feedback. Much appreciated and will most definitely help! It is really a great and helpful piece of info. I glad that you shared this helpful info with us. Please keep us informed like this. Thanks for sharing. Thanks, Boyou, I appreciate your kind words! Are there cases available for the Questlove Pocket? Do they nest? Easy to set up if taken to a gig? There are cafe kits at half the weight but they are more than 4x the price! I’m a short adult and I like the small size, especially if they are easy to set up and take down. Yes, these cases do nest and they will fit the Questlove perfectly if you buy the individual sizes separately (you need 10″, 12″, 13″ and 16″). And I think that with a little routine you can easily get the Questlove Pocket set up in less than 15 minutes (taking down should be even quicker). Just wondering why “Perfect size for children up to 5ft” is listed as a “Con” in your junior drum kit reviews. Did you mean that? Why would it be a “Con”? That should have been grouped among the Pros of course – thanks for the hint! We are buying a drum kit for my 4 1/2 year old. We like the look of the Questlove Pocket, and the price point is right. Not being drummers ourselves, this may sound like a silly question, but it seems to have one less drum than the others you have recommended! Is this important?! Thanks for your question. That question makes a lot of sense! In my opinion, having only 2 instead of 3 toms is not a problem, as long as those 2 toms are located where they would be on a standard acoustic drum set. Since this is the case here, your child won’t have to unlearn any motion / retrain any muscle memory. Thanks for the information, I’m a drummer with a 2 years old son and I want him to learn. At this moment I don’t have a kit and I was thinking on getting an electronic one so maybe we both can use it, I’m thinking on a Yamaha or a Roland. Do you think he will be able to play/learn in such a large kit or should I get one for each of us? Thanks for your question! It’s a good thought and many parents (understandably!) want an electronic kit for their child, but I wouldn’t recommend it. As you say, any electronic kit would be much too large for a 2 year old and would only cause him her to have to stretch and strain plus internalize muscle memory that will quickly become useless or even a hindrance. Hey, I’m writing again just to let you know that I found an opportunity with a Mendini and overall is a good kit, I still have to tune it properly but my son found it super attractive. Trone is still high for him for kicking but I think we can start with some basic hand coordination. I’ll try to keep updating progress. That sounds great, I’m happy for you – and thanks for letting me know! If you need guidance for tuning, this is a good and short tutorial. 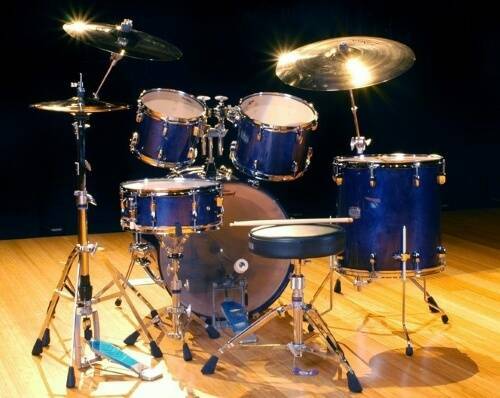 Thank you so much for writing your articles on drum sets! As you might have read, I recommend adult drum kits from 5ft upwards, so he should still go for a kids drum kit. Within that range I have 2 recommendations. My son just took up drumming in his elementary school band last year. The elementary school only gets hand me downs from the high school. They do not have a drum set. They have 3 broken snare drums that are missing the ”snares.” They have one big bass drum and 10 kids in their percussion section. My son is also a Boy Scout and would like to help improve the equipment by seeking donations. What would you recommend that we look for? I saw the junior kits that you reviewed and am wondering if that would serve the purpose or if he should seek donations for specific pieces? We would ask the teacher, but we are hoping to surprise her and the other students. Thanks for your question – and great you’re son is getting into drumming despite the obstacles. The curcial question here is: how tall is he (and how tall are the other kids in the band)? If they are below 5ft, you can go for any of the kits I’ve reviewed in this article here. Otherwise – i.e. in the unlikely case that he’s taller than 5ft already – I recommend you go for one of the drum kits over here. Do you know of any electronic junior drum sets you reccomend? Thanks for your question and sorry for the delayed reply! Well, there are no electronic drum sets that are tailored to children (i.e. smaller than standard ones). That said, electronic drums are generally easier to set up lower than standard drum sets. So if you’re set on a proper electronic drum set, I recommend you check out this one (the mesh version).